We haven’t had a review in a while. That might be due to the fact that all 3 contributors are extremely busy with life, marriage, new jobs, and whatever other excuses we want to drum up. It could also be because it seems fast food has really levelled off. The market is over saturated with everyone rolling out the same old items rebranded with a different name, or an added sauce. 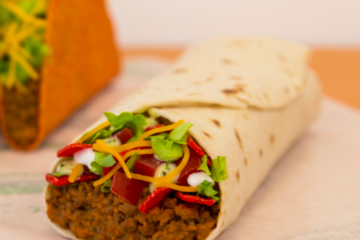 Well, we’re back and this time it’s because Taco Bell has decided to push the limits gut busting fast food once again. 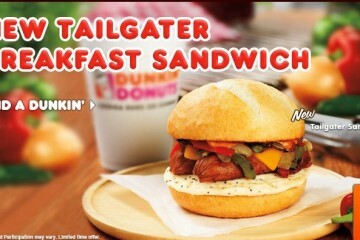 They are calling on you (or us) to be “Breakfast Defectors”. 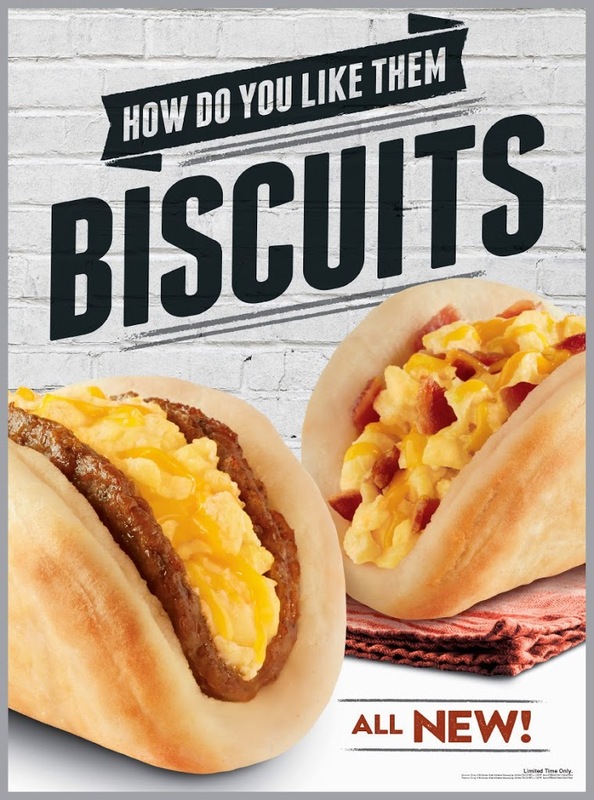 They are urging us to break loose from the chains of traditional breakfast’s served on english muffins, or with a side of hash browns. 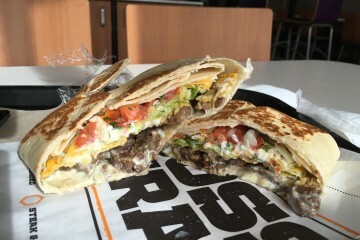 They are sliding that hashbrown into your breakfast wrap, pannini pressing that sh*t, and calling it an AM Crunchwrap (ironically mine had very little crunch). 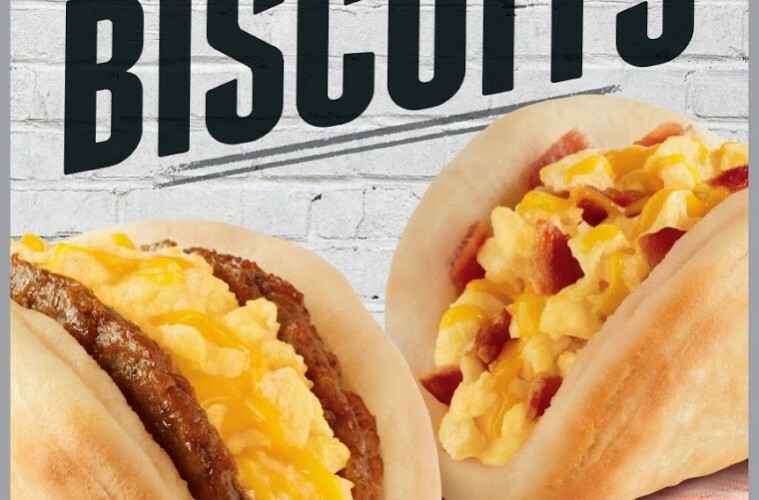 They are taking that biscuit you love to eat alone, shaping it into a taco, slapping some breakfast meat in there, sprinkling it with cheese, and marketing it to fellow recovering breakfast meat addicts like myself. Naturally, there is a Taco Bell smack dab in the middle of my AM pick up hockey skate and my place of employment. 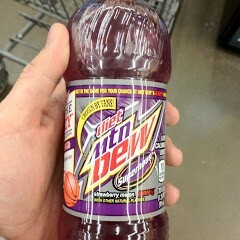 So it was only a matter of time until I succumb to the urge of consuming 1000 calories in 10 minutes and spending my Friday agonizing with regret like a Seahawk’s fan post Superbowl XLIX, except this time I’ll be Marshawn Lynch, and I will be running, but not with a football and not to the endzone. Let me preface this review by saying that I think by waiting too long to try these items after their release, I over hyped them in my mind, and was fooled by all the late night propaganda infilitrating my fat kid mind. In short, my expectations were sky high. 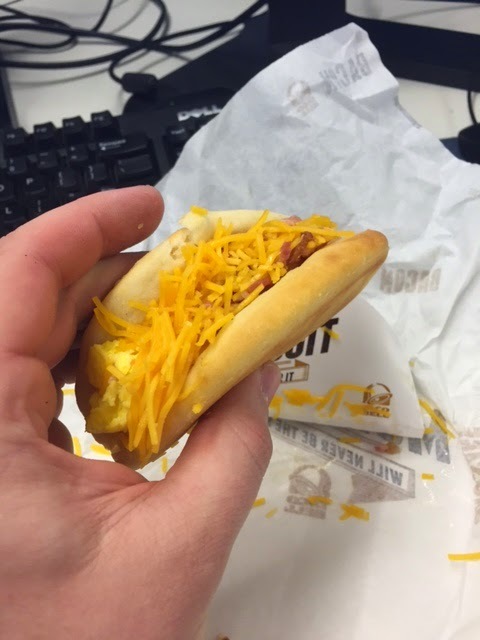 I should have been wary and cognizant of my prior encounters with a Taco Bell gimmick item, and known that if its too good to be true, it likely is. I arrived at work, cast my belongings astray, and assumed the position to devour this little treasure trove of taco tastiness. Two bites in, no stomach ache yet, but I was a little off put at how dry the biscuit was, and how hard it was to breathe as I struggled to swallow each bite. 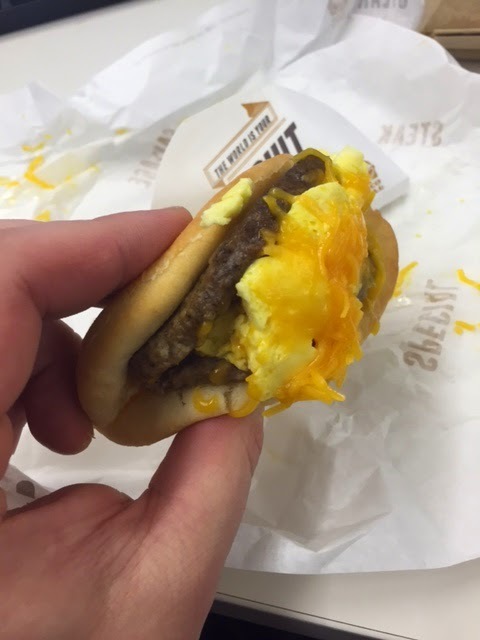 The sausage had good flavor, but the eggs and cheese were nothing to write home about. 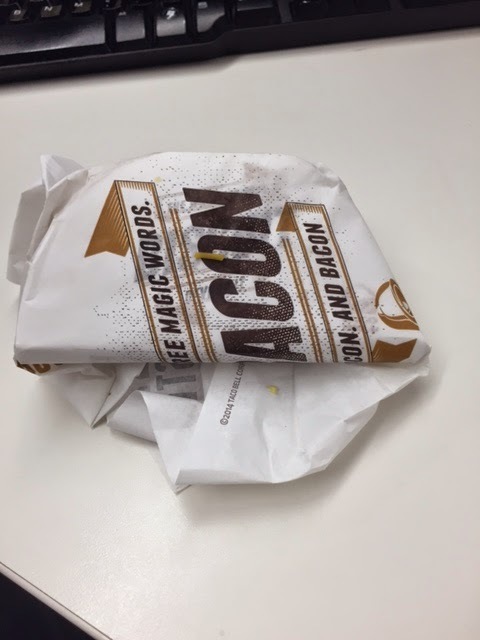 I slammed down my first one and prepped for the next one of bacon variety. Round 2: Same result. 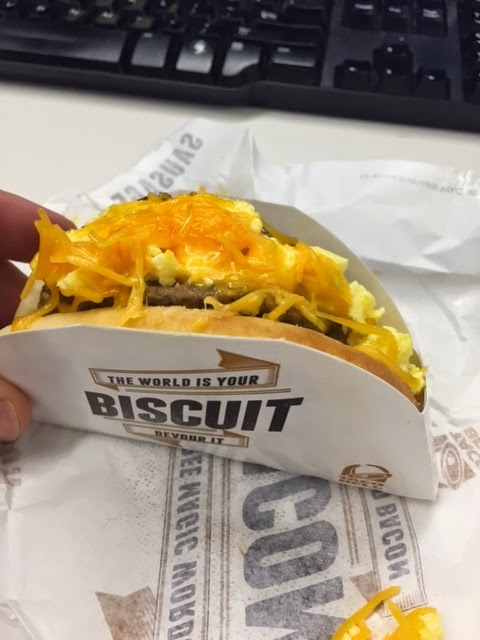 Dry biscuit, barely melted cheese, except this thing was sprinkled with tiny bits of bacon (I think), and for the first time in history I was a off put by the consistency of bacon. It seemed to be flavored artificially, and was chopped up into tiny pieces like a Dahmer victim. 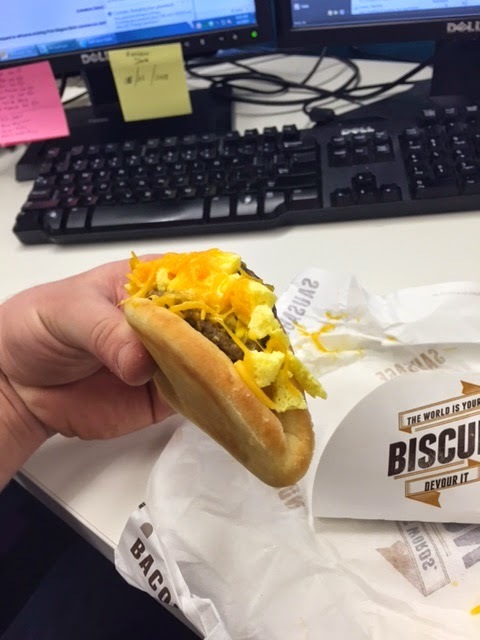 Smattered inbetween the egg and half melted cheese, and stuffed into the biscuit taco (drywall taco). 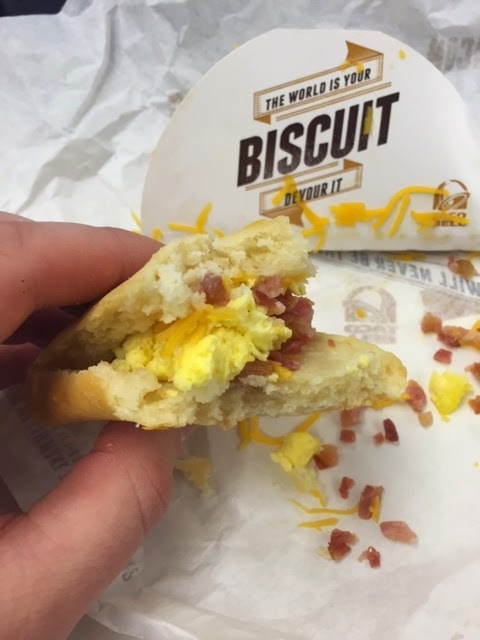 Three quick bites and I had reached the apex of Mount Breakfast. I was the Yasiel Puig of Breakfast Defectors, except there was no million dollar contract on the other side, just lots of disappointment.